Welcome to the Knight Moves locations thread! The location for the Calley Family Trucking and Riggins Distributors is near the old Castaic Junction Restaurant, located at the intersection of I-5 and Highway 126 in Castaic, CA. Both the Calley Family building and Riggins buildings are still there, and look how close they are to each other! Looks like Riggins Distributors has finally shut DOWN and moved on. Demloished early 2012 by the looks. However the Calley Family building still exists at the moment. Seems this area is being heavily developed in the upcoming years. The hijack scenes were filmed on the old Golden State Highway heading towards Pyramid Dam and Pyramid Lake, Piru Creek, San Emigdio Mountains (just north of Castaic). These locations were also used for the hijacking scenes in the episode ‘Big Iron’. Whilst the main hijacking scenes were filmed on the Golden State Highway, the cab scenes were filmed on ‘The Old Road’ Castaic, just metres from the Calley Family building and Riggins buildings. For reasons unknown, the first hijacking scene is filmed in two different locations. And if you spin around and look behind you, it’s also where Michael climbs out of the Foundation semi, and climbs into KITT. More locations for this episode to follow. I’ve always thought something was amiss with the roads at this location, and it turns out for good reason, as the location for Chief Joe’s Cafe and truck stop was filmed on the runways of Agua Dulce Airpark in Agua Dulce. Left Photo Copyright of Agua Dulce Movie Ranch Website. An episode of MaCgyver also made use of the location apparently. 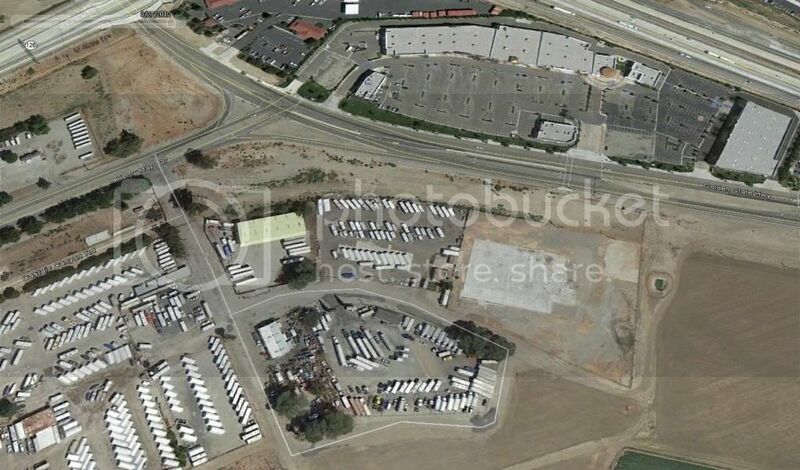 So although it looks like a truck stop, it was part of a private airport runway? Why would they film there? Easier access for the trucks to be parked up? Also where did that photo of the airport come from with the two flags? I don't see the grass from the TV show, or has it just dried out over the years? It is an odd choice for a location isn’t it, I’ve no idea why it was chosen, but like I said above, I’ve always thought something was amiss with the roads at this location... and that's why. The photo you speak of is from an episode of ‘MaCgyver’, I can’t remember which one, once I found this location for Knight Rider, I did a quick search which revealed it’s been used for other productions as well, so it was a reasonably popular choice for location work back in the day. I saw your comment in the ‘Lost Knight’ thread, I’m still active in the locating locations business… but I’ve just been busy with life this past year, but I’ve got quite a few more locations to post, as well as still actively searching for others… I’ll be posting them soon. The macgyver episode shown above is title "Last Stand" It was released in 85 so I imagine knight rider was shot there first. Amazazing how quickly it changed. Here is a little clip from the macgyver episode. Towards the end of the clip you can see the side of the building and nearby mountains. There is lots of similarities between Macgyver and Knight Rider. Not just with shooting locations but with themes as well.